That question, if it can be answered at all, requires a wide-ranging study of the cultures, rituals, customs, economies, languages, art, architecture, religions and world views of human societies past and present. Anthropology sets out to do just that, through the four lenses of its major subfields: sociocultural anthropology, linguistic anthropology, physical anthropology and archaeology. As a student of anthropology, you will acquire the concepts, theories and methods that will enable you to explore, describe and understand the human world in all its complexity. At the same time, you will be encouraged to pursue in depth your own areas of interest. At Brandeis, you will be taught by faculty who are active, research-intensive scholars and dedicated to their students. They will encourage you to think and learn deeply—not only through books, but in the field. Because of our emphasis on writing and in-class discussion, you will graduate with solid skills in data collection, critical thinking and communication. You will be well prepared for graduate study and a scholarly career in anthropology, as well as for a career in any field dealing with people—from health care to government, from business to journalism, from education to human rights work—anywhere in the world. Anthropology allows for an almost infinite range of inquiry, from embarking on an archeological dig in Concord, Massachusetts, to studying immigrant Russian women in Helsinki, from analyzing ancient Mayan artifacts to making a film about the ethics of fashion and the Peruvian alpaca wool supply chain. This is a truly interdisciplinary field. Our affiliated faculty work in departments and schools across the university, including the Department of Classical Studies, the Department of Computer Science and the Heller School's Sustainable International Development Program. Field work can take you far. Our faculty do field work in the United States, Africa, Latin America, East Asia, South Asia, Oceania—and you can, too. Our faculty are highly productive researchers and popular teachers, as illustrated below. Elizabeth Ferry recently published "Minerals, Collecting, and Value across the U.S.- Mexican Border," her second book, in addition to being a recipient of the Jeanette Lerman-Neubauer '69 and Joseph Neubauer Prize for Excellence in Teaching and Mentoring. Anita Hannig published "Beyond Surgery: Injury, Healing, and Religion at an Ethiopian Hospital" in 2017 and was awarded the Michael L. Walzer ’56 Award for Teaching in 2018. Sarah Lamb is a widely recognized scholar of aging from a cross-cultural perspective, an author of multiple books, book chapters and articles, and is also a recipient of the Jeanette Lerman-Neubauer '69 and Joseph Neubauer Prize for Excellence in Teaching and Mentoring. If you're passionate about anthropology and up to the challenge, you might consider devoting your two final semesters to completing a senior honors thesis on a research topic of your choice. Recent student theses include "Aging and Contemporary Art: A Narrative Ethnography," "Bodies Together, Worlds Apart: Success, Suffering and the Mid-Day Meal," "Doctors, Herbs, and Spirits: A Study of Integrative Healing Practices in Uganda" and "A Little Lhasa in Boston: Constructing a Tibetan Identity in the Diaspora." As a student of humanity, immersing yourself in another culture makes perfect sense. What better way to practice a second language or gain cross-cultural perspective? Many of our majors and minors live and study abroad for a semester—in many cases for credit. We have approved programs in Chile, Senegal, Mexico and Vietnam. Many anthropology majors live the Brandeis commitment to research, learning, and social justice by being engaged scholars. With the support of grants, they do research, public service and fieldwork—right here in Waltham and around the world. In addition to pursuing graduate work, anthropology graduates go on to rewarding careers in a wide variety of fields. Our alumni are working in nongovernmental organizations, politics and education all over the globe. Jeff Arak ’07 is currently a freelance filmmaker living in New York City, producing videos that tell stories and increase critical understanding about our world. Matthew Kupfer ’12 is currently a Junior Fellow in the Russia and Eurasia Program at the Carnegie Endowment for International Peace in Washington D.C.
Noam Sienna ’11 is a PhD student in History at the university of Minnesota-Twin Cities where he studies Moroccan Jewry with Professor Daniel Schroeter. Katherine Weisensee ’99 is currently department chair and associate professor of Anthropology at Clemson University. Contact Professor Anita Hannig to learn more about how the anthropology curriculum is structured and what you would need to do to major in this field. You might choose the anthropology minor to complement a major in history, sociology, health: science, society and policy, or another field. See the requirements for the minor in the University Bulletin. Brenton Easter ’02 is a special agent in the Cultural Property Division of Homeland Security Investigations. 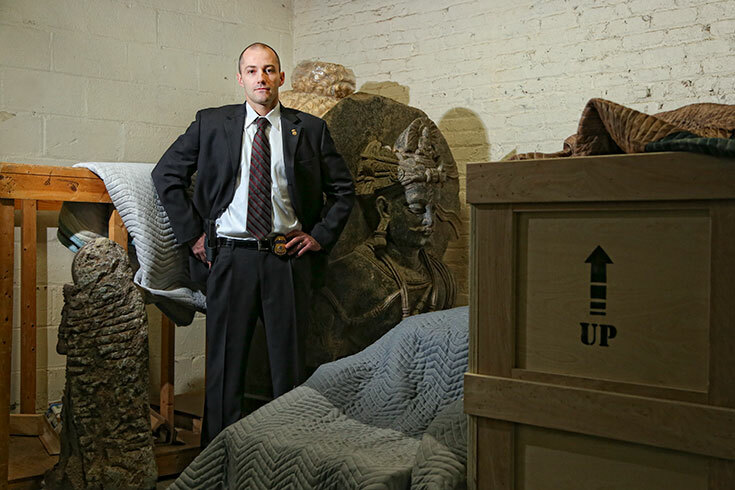 His team tracks down art and antiquities that are looted from places like India, Afghanistan, Italy, Nepal and Thailand, and then shipped illegally through international ports.